We’re big advocates for regular roof maintenance all-year round. Summertime should be spent with family and friends, enjoying the weekends and not having to worry about tedious household maintenance. Our experts at Aabco Roofing have put together a spring clean checklist for you to follow to ensure that you don’t miss anything important where your residential roofing is concerned. Of course, there are always things to be done in the upkeep of your home but roof maintenance is not something that should slip by you. Summer particularly brings a few roofing issues that you should be aware of. It is a common misconception to think that winter has the harshest effects on our roofs. Summer brings its own roofing issues that require proactive maintenance in order to avoid damage to your roof structure. Summer rains and moisture build-up due to warm weather, encourages moss and algae to grow quite rapidly. Over time, moss can take over your whole roof. It is important to have your roof checked and cleaned by a licensed and insured professional pressure cleaning company. The sun’s UV rays combined with the heat of summer can dry out shingles and flat roof waterproofing causing cracks, peeling or even shrinking. If not addressed your roof can become an unnecessary candidate for roof replacement. Wind and rain are inevitable during summer. High-speed winds can cause your shingles and tiles to lift if nor installed properly. This allows rain to get in and you’re left with a leak. Small, avoidable damage can eventually affect the rest of your roofing structure. If you suspect there has been some damage after a storm, address it right away to prevent any further damage. Overhanging trees can be a problem during a storm so be sure to have them trimmed regularly. Without proper ventilation in your attic, hot air gets trapped. Excess moisture will cause degradation of your roof and shorten the life span. Gutters that are jammed with leaves and debris cannot efficiently carry water away from your roof which leads to further problems. If your gutters are not in a good state, consider replacing these before summer so that you’re not caught in the rain, trying to drain your gutters. Loose gutters will also pose a problem because of roof drainage so once you’ve cleared your gutters, test that they are securely in place to run down water. Big tree branches hanging over your house may add to the overall aesthetic but they can cause some trouble for you and your roof. Old and broken tree branches can fall onto your roof and cause damage during storms. Mold can be unhealthy for you and your family. Mold usually appears inside your house but it is one of the first signs that there is some damage on your roof, allowing water to get in. Clean your roof of any debris such as leaves and branches. 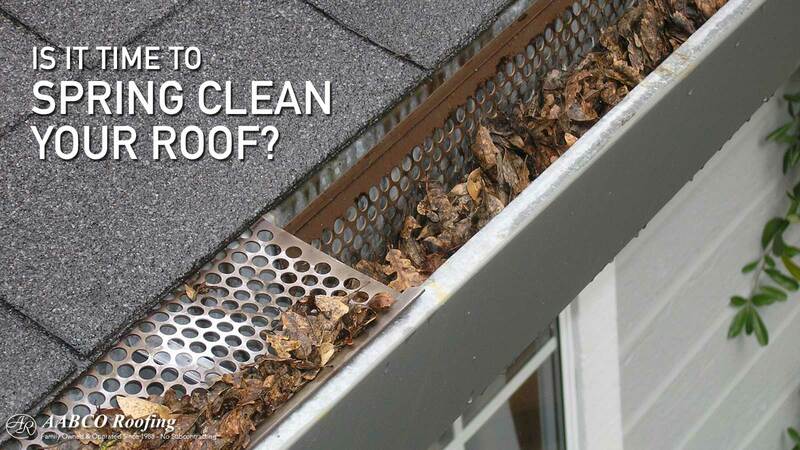 Leaving debris to build up on your roof can cause roof leaks. Rotting shingles and broken tiles will allow water to seep into your house through the roof. Check for any areas on your roof that need sealing. Pests like rats, raccoons, and squirrels will take advantage of open gaps along your roofing edge and move in if they get a chance. This can create all sorts of problems for your roof including your electrics. Not to mention diseases that these animals carry may affect your family. If your roof has a skylight, make sure that all the sealings have been taken care of before summer rain has a chance to seep in. Repair or replace any shingles or tiles that may pose a problem during summer. If you’re unsure about the state of your roof in this regard, call a roofing expert to assess the condition of your roof. They will be able to provide you with a thorough inspection and provide any support that may be needed to improve the condition of your roof. At Aabco Roofing, we believe in taking proactive measures in extending the lifespan of your roof. We understand that the responsibility to upkeep your home can get tiresome and that sometimes, elements that are not directly visible to you may slip through the cracks. We’ll take care of maintenance, repair, replacement and even the seemingly minor tasks like gutter clearing because the longevity of your roof is our business.